The first historical account of a legal debate about the status of indigenous peoples dates back to the sixteenth century, when Bartolomé de Las Casas argued in favour of human rights to be granted to the indigenous peoples in the new Spanish colonies of the Americas. But it took very long until special consideration was given to indigenous peoples on the level of international law. From the 1950s, the International Labour Organization adopted specific conventions focussing on indigenous peoples’ rights. And from 1982, another UN body was concerned with preparing what was then adopted by the General Assembly in 2007 as the Declaration on the Rights of Indigenous Peoples. Its observance is of major importance for anyone contacting indigenous peoples or working on any issue related to these cultural groups. Although the definition of indigeneity is a very difficult matter, researchers should ensure that they never violate any rights. 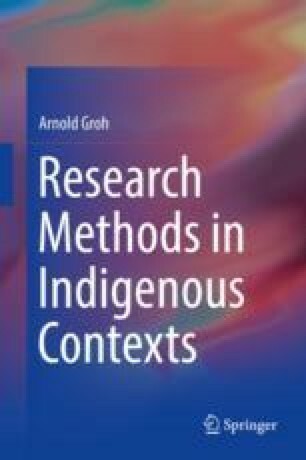 In this chapter, we go into the details of the Declaration’s articles that are particularly relevant for field research in indigenous contexts. Foremost, indigenous peoples are granted their right to self-determination. States are under obligation to protect indigenous peoples, their cultures and environments. Indigenous peoples have the right to revitalise their culture, they have cultural autonomy in education and lifestyle, and they have land rights. In media and education, indigenous culture has to be reflected correctly. Researchers have to make sure that they never obstruct the indigenous peoples’ exercise of these rights but rather counterbalance existing impediments. Simon, B. S. (2005). Intellectual property and traditional knowledge: A psychological approach to conflicting claims of creativity in international law. Berkeley Technology Law Journal, 20, 4(Art. 5), 1613–1684. Available at: <http://scholarship.law.berkeley.edu/btlj/vol20/iss4/5> (accessed 26 July 2017). https://doi.org/10.15779/Z38F69H. Tisucká, B. (2014). The intertwinedness of forest and cultural landscapes in the context of cultural ecology. Envigogika: Charles University E-journal for Environmental Education, 9, 1. Published 30. 5. 2014. Available at: <https://envigogika.cuni.cz/index.php/Envigogika/article/view/428/566> (accessed 28 July 2017). https://doi.org/10.14712/18023061.428. Yehuda, R., Daskalakis, N. P., Bierer, L. M., Bader, H. N., Klengel, T., Holsboer, F., & Binder, E. B. (2015). Holocaust exposure induced intergenerational effects on FKBP5 methylation. Biological Psychiatry. https://doi.org/10.1016/j.biopsych.2015.08.005.